Preheat the oven to 200°C/390°F on grill or broil mode. Zest one lemon and set aside for later. Trim the scallions, slice the lemons, and spread them over a baking sheet. Sprinkle with olive oil, season with freshly grated nutmeg and salt, and roast in the oven for approx. 5 min. Remove from the oven, add the white wine and maple syrup, and bake for approx. 3 min. more. Next, chop the garlic and mix it with butter, a pinch of salt, lemon zest, anise seed, and pepper. 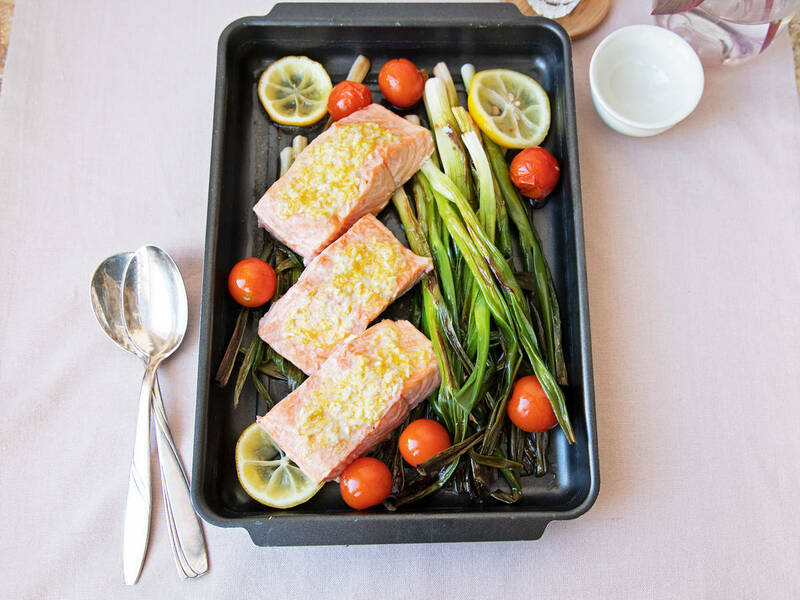 Place the salmon fillets on the baking sheet on top of the scallions and distribute the garlic butter mixture evenly on top of each fillet. Add cherry tomatoes and return to the oven for approx. 5 min. or until salmon is cooked to your liking. Serve immediately and enjoy!